The pipe and tabor is probably the oldest form of one man band. 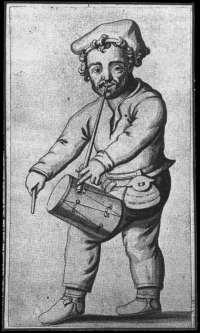 One musician played a three hole pipe in one hand and used a stick in the other to play a small drum – a tabor – suspended on a cord from the wrist, elbow or shoulder. Thus a pipe and tabor player was called a taborer, though this combination was also known in England as ‘whittle and dub’, a wordplay on ‘wattle and daub’, probably derived from ‘whistle and tub’! During the renaissance, the pipe and tabor was popular in France, the Basque country, the Netherlands, and England, being especially popular among folk musicians who played for display dances (dances for a watching audience). It was evidently used in social dancing (dancing for joining in) too, as it was described in Orchesographie, Thoinot Arbeau’s manual of French social dance, published in 1589. While nowadays, morris musicians often play melodeons, concertinas or accordions (though potentially you could play morris music on any instrument – and some morris sides do), in the 16th century, pipe and tabor was the standard accompaniment. It was famously the accompaniment Shakespearean clown and morris dancer William Kempe chose to play for him as he morris danced all the way from London to Norwich in his “Nine Daies Wonder” of 1599. While Will Kempe danced to a taborer, Richard Tarleton, a founding member of Elizabeth I’s own acting company, The Queen’s Men, was a taborer himself and is pictured above.